I regularly whip together some version of homemade cream of vegetable soup, but when I put together this creamy broccoli cheese soup with a hint of bacon, my husband and the boys said it was one of the best I've ever made. What's the “surprise” ingredient? I raided the pantry for some dehydrated summer squash to use as an extra thickening agent. Eureka moment! It's a great use for an abundant veggie, and adds a little more vegetable punch to the recipe, which is never a bad thing. This recipe makes around 8-10 servings, unless you're serving teenage boys who say, “This is really good!”, and inhale nearly all of the soup in one sitting. 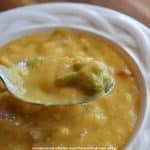 This easy gluten free broccoli cheese soup soup is rich and creamy and loaded with veggies and bacon and one ingredient you may not expect. In a large heavy stock pot or Dutch oven, saute bacon until crisp. Set aside. Use the bacon grease to saute the onions, garlic, celery and carrots. I like to get my onions cooking first so they get a little more done. While the onions start cooking, I finish chopping the garlic, celery and carrots and add each as they are ready. If your bacon didn't have much fat, you can add a little extra butter for sauteing. Cook until carrots are crisp tender, stirring occasionally. Do not brown. Add broth and broccoli to stock pot. 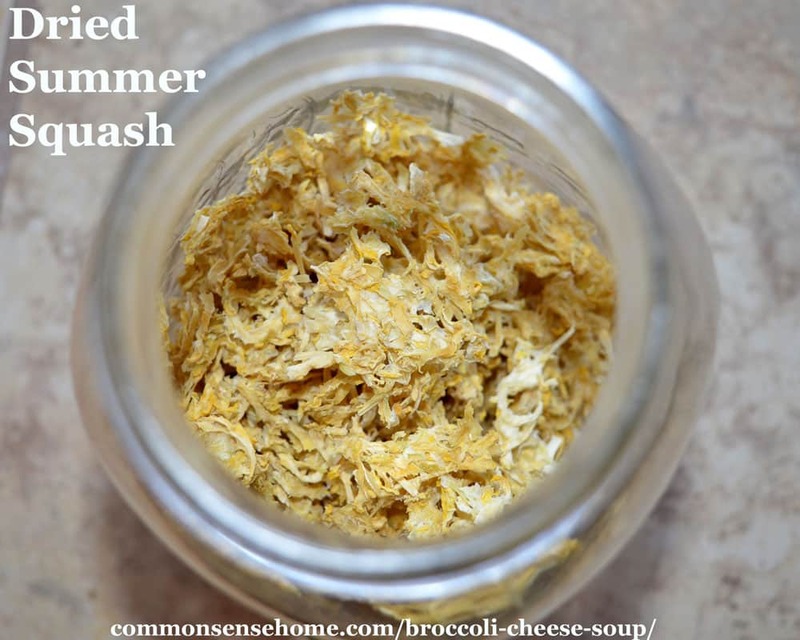 Pulverize the dehydrated summer squash in a blender or food processor until it becomes a fine powder. Volume should reduce by about half. Add powdered summer squash to stock pot. If you don’t have dehydrated summer squash, you can either add more cornstarch or simply have a thinner soup. Simmer until the broccoli is tender (with frozen broccoli, heat through), at least 10-15 minutes, to give the summer squash time to rehydrate and start to thicken the soup. In a measuring cup or small bowl, mix enough cold water with the cornstarch to form a loose slurry (about an equal amount of water and cornstarch). Stir cornstarch slurry into simmering soup, taking care to mix thoroughly as you are adding so it doesn’t clump. Do not boil – that will make lumps more likely to form. As it cooks, the broth will thicken. Once broth has thickened, add spices and cream. Heat gently, do not boil. Once heated, start adding cheese, mixing after each addition, until all the cheese has been added. Crumble the bacon into the soup to finish. Pair this soup up with some fresh bread or a salad, and you’ve got a quick and nourishing meal. 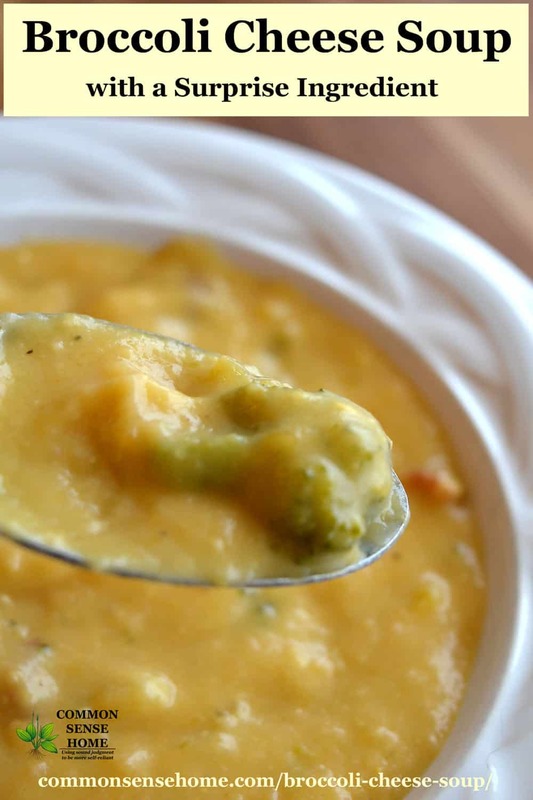 If you prefer a non-cheesy soup, check out the cream of broccoli soup recipe. We also have a recipe for homemade bread bowls for soup here. Summer squash is super easy to dehydrate. All you do it shred it finely, spread it on your dehydrator trays, set the temp at 125°F (52°C)and dry until crisp. If you have shredded squash in the freezer, you can thaw, drain, and then dehydrate. If you'd like to see the process step by step with photos, check out “The Best Way to Use Up Extra Zucchini“. Do you have an unusual way to use zucchini or summer squash? I'd love to hear about it. If you like home cooking, then you'll enjoy the Common Sense Home Recipes and Kitchen Tips page. All of our recipes are listed in one spot and sorted by category to make it easy to find your favorites. This post is written by Laurie Neverman. Laurie is the creator of Common Sense Home (formerly Common Sense Homesteading). 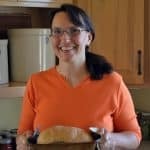 She was raised on a small dairy farm in northwest Wisconsin, and worked in the family catering business (Irene's Custom Cakes and Catering) as her summer job through high school and college. They baked thousands of homemade dinner rolls, and hundreds of pies, cakes and other tasty treats, as well as full course meals for parties of two to several hundred. In college, Laurie earned her BS in Math and MS in Mechanical Engineering, with an emphasis in Alternative Energy. She and her family now live out in the country in their Green Built certified home on their permaculture oasis in progress homestead. Learn more about Laurie here. This sounded very appealing and different and I was determined to make it today. Didn’t have enough frozen broccoli so decided to use my home dehydrated broccoli. So then I decided it might be a good chance to use some other dehydrated veggies I have on hand so used all dehydrated vegetables in place of fresh. I also used half and half instead of the cream and omitted the cheese. I used the squash powder as you suggested (great idea!). Even with all the substitutions, this was a delicious soup! The flavor is unique and very tasty and satisfying, especially on a cold winter’s day. Thanks for a great recipe that really changes things up! Glad you liked it, Norma. I always tend to view soup recipes, especially something like a veggie based soup, as a starting point to build on with whatever you have on hand. cant make cheesy brocc soup without ham! so no bacon for us, but the soup is delicious!